Home owners unite. In earnest. The historic home buyers crowd is continuing to organize in this area. Recently, I was invited to speak at the First Annual Historic Home Buyer’s Expo, presented by Historic KC in Kansas City. The event took place in Kansas City’s historic Union Station. The room for the speakers was inspiring. Really tall ceilings with windows all along the north wall, from about 5 feet off the floor rising maybe 12-15 feet. The glass was frosted so it was just a giant wall of glowing, cool north light, spilling into a long, terrazzo floored room. Someday when I grow up, I’ll come back to that room and it will seem smaller. The trim is huge and made of plaster. In fact, a man who worked for the company responsible for a lot of the plaster created during this station’s recent restoration was presenting in the next hall. There were chairs for about a hundred people in the room with a long carpet the whole length in the isle of the seating. It was naturally warm and comfortable. The room was less than 50 feet from the station’s main floor. The station’s main floor is like the grand canyon, bigger than can be understood. On the diagonal side of the main floor, in the wings, was the other trade show room. A young expo in a grand environment. Friday night was spent in the trade show room. It was as beautiful as the speaker’s room, but cozier. The scale of these rooms is huge, discrete to the point of whim, with the amazing trim, naturally lighted glass and the right furniture, making the room very nice. Several vendors filled the room, not really booths but tables with dark surroundings and a glass wall on one side. It felt professional and comfortable. We hung out and laughed at who we knew from around town. We were glad to be reminded of one another’s natural interest in preserving historic houses. Not just because we’ve made a living at it, but because we’ve made a difference. The public, attending the room, was cool. People with a sense of history in the property they moved into. These people have spent more time on the internet, gathering information, than can be imagined. These are people whose kids are grown, or they never had them. Maybe they’ve got kids, but, have that weird ability to do almost everything. It’s a good crowd to throw yourself into. The room feels good, the expo attendees are fun and full of stories. I meet a guy restoring old tractors, that’s a real win for me. We laugh at the Mid Century Moderns for their manic defense of their houses. This MCM community is preserving a great stock of houses that are becoming appreciated for their historic significance. My wife was with me on this trip too. She’s a pro when it comes to working a pretty room. It was a rehearsal evening with a live audience. Saturday was fun. I was given fifty minutes in the speaking room, and knowing the relaxed conversational style of historic home chat, I knew that wasn’t enough, especially with a bunch of people in the room. The How to Have a House workshop is four hours, and that’s if there’s twenty five people in the room or only three! 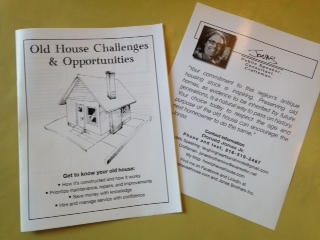 For the Historic Home Buyer’s Expo I blogged out a handout based on the How to Have a House work book. It allowed me to put a value in the hands of the attendees, and, knowing I’d never make it through five sections of a house workbook, I was able to relax and enjoy the time I had. It felt good. I was scheduled for the opening slot on Saturday morning, I was glad. This was a job that was all about the mood and attitude of historic home ownership. Get that covered and the rest is more effective. I gave the room my best and found the audience to be lively and ready for the day. We spent the rest of Saturday until about 4:30 in the trade room. It really was nice. It was apparent that a lot of highly qualified home owners, contractors, craftsmen, tradesmen, relators and other professionals, are, through the natural inclinations of their hearts and minds, preserving a lot of historic homes. I’m glad to be a part of this crowd. I love that you are a part of this crowd. ‘Nothing like an old house to charm the soul.